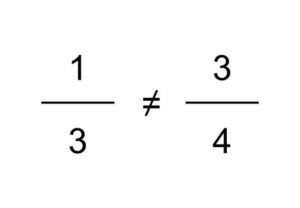 When my son was initially learning about fraction notation, he told me the following, right at the end of a class. My son: Daddy, 1/3 is the same as 3/4. My son: The 3 in the denominator tells you how many quarters there are in the fraction. Wait a minute! 1/3 is not equal to 3/4. Strictly speaking, this is not evidence that my son learned anything about fractions in that class. This is just a single performance. Many people would say that in this performance, my son failed to demonstrate an understanding of fraction notation. The goal of teaching though is not to generate specific student performances. The goal of teaching is to produce long-term changes in what students know and can do. While we study performances in classes and use these to make short-term decisions about what to with our students, we should also systematically compare these short-term performances with the long-term changes in student performances that then correspond to their learning. I asked my son a couple of weeks later if he thought 1/3 was equal to 3/4. He told me, “Oh no Daddy. 1/3 is definitely less than a half and 3/4 is definitely more than a half, so they can’t be the same.” As it turns out, the lesson in which he made the first statement was focused on being able to place fractions on a number line in order to be able to compare the relative size of different fractions. So he learned something about towards that objective, even though his performance during the lesson seems like he did not.